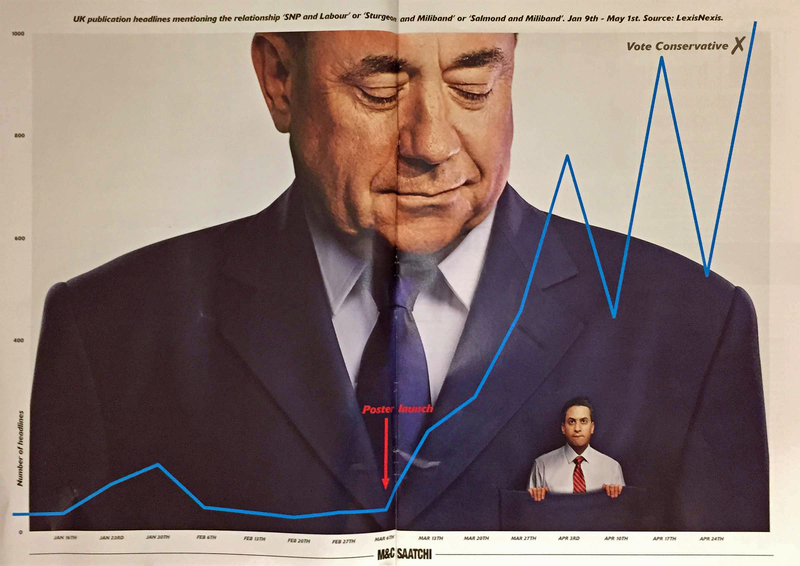 M&C Saatchi, the creative agency behind the Conservative Party’s “Miliband in Salmond’s Pocket” poster, today ran a house advertisement in the advertising trade magazine Campaign. I have argued – and will continue to argue – that not only is it the most memorable political poster for years, it must also rank as one of the most effective posters of all time. The poster – and subsequent coverage relating to its contents – significantly altered the minds of millions of voters and changed the course of British election history. Not many posters – of any genre – can claim to impacting our society in such a massive and lasting way. The advert shows how the British media’s coverage of a possible SNP / Labour Coalition deal increased dramatically the day the ‘pocket’ poster was released and continued to grow. The analysis of newspaper headlines in this advert replicates almost exactly the analysis of google search data that I carried out earlier this week. As I said when it was launched, this poster will without doubt be the most iconic image of general election 2015 (followed closely by Miiband hubristically revealing #EdStone). It is the most memorable poster (of any genre) for years. And given the fact that the poster was the catalyst for popular debate around the possibility of a Labour / SNP Coalition – an issue that is widely accepted to be a significant factor in the Conservatives victory – it must go down as one of the most effective posters (of any genre) of all time. Next Who is Ivan Massow?